Stop Winter Snow and Salt from Damaging Your Landscape! Every year, lawns and landscape shrubs take brutal damage from de-icers, snow piles, and plows. We want to keep the sidewalks and pavements clear of ice and snow, but we wind up costing ourselves valuable plants in the process. What can be done? 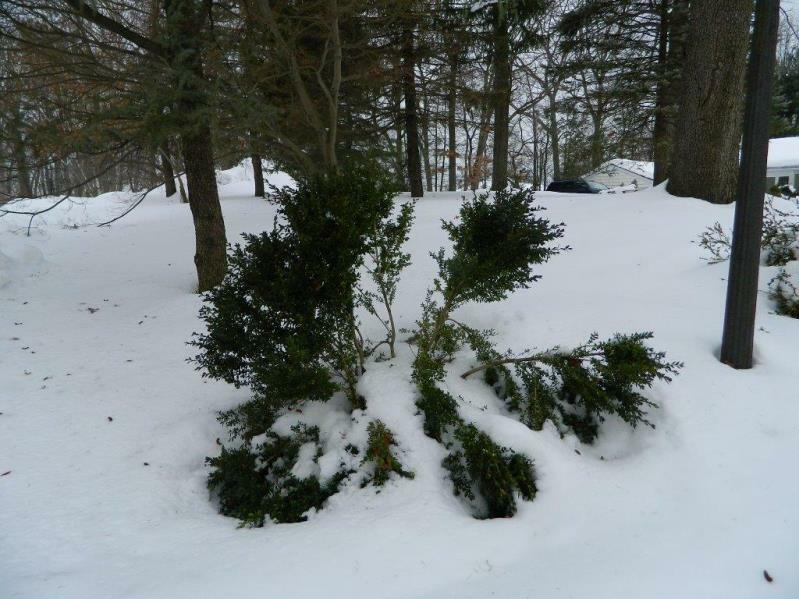 When you plant your shrubs, remember to think about your snow removal process. Do you plow up your driveway and dump the snow at the top? If so, make sure that landscape plants will not be damaged if placed in that area. Or, does the snow plow with rock salt come down your street and put a constant barrage of snow and salt on the front of your property? If so, it might be best not to plant right along the street. Some suggestions: If you already have plants near the road, you might want to provide a barrier, for example, you may wrap them in burlap to try and protect them, or put up a snow fence. Shoveling is hard work and putting that snow in the closest location is very tempting – but DON’T! Piling snow onto your shrubs will cause damage that they might not recover from. This is especially true if there are large amounts of snow that do not melt right away. Heavy snow will bend the branches and disfigure or kill them. Don’t put snow on the plants, instead, try to take any heavy snow off of them. Pre-snow suggestion: You may also prepare your trees and shrubs ahead of time with proper pruning and bracing. Not all de-icers will cause damage. The most used one is rock salt (chloride) but this is very caustic and will cause damage to pavers, concrete, cars, plants and lawns. If you use this, use it sparingly, especially near your lawn and plants. Remember that when the salt melts the ice, the run-off can go into your lawn areas. Other de-icers? Calcium Chloride is less harmful to plants but it is still corrosive to concrete and metal. Magnesium chloride can be a good option. Calcium Magnesium Acetate is the most expensive but, when used correctly, is low in toxicity and the most environmentally safe. Using a de-icer sparingly and shoveling more often will help, as well as using a de-icer that is less caustic to your property. Wait until the snow and ice have fully melted before assessing any damage. You will be able to see at that point any spots where salt may have affected your plants, or the weight of the snow might have bent the branches. And, of course, call Truesdale so we can help you. Our experts will walk the property with you and advise you of what is truly damaged and what will bounce back in spring.